Update 5/20/2013: This stencil has been updated. Head to my VMware Visio Stencils and Shapes permalink page for the latest version. 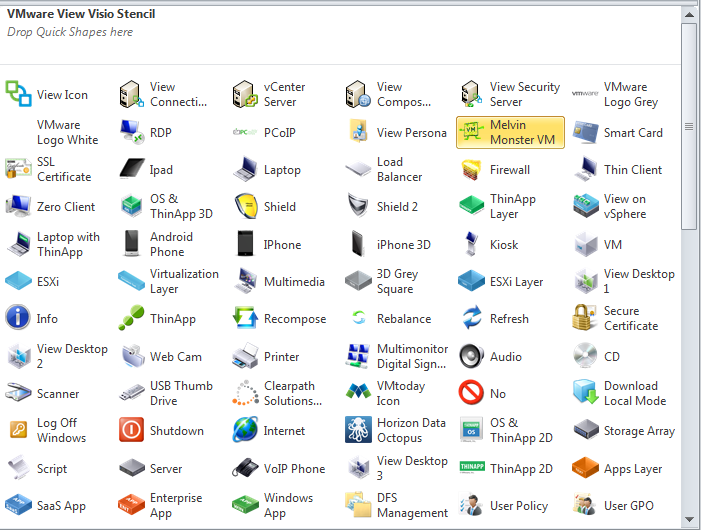 Yesterday I posted a Visio stencil with some generic VMware icons. I also have put together a Visio stencil for use in diagraming VMware View virtual desktop infrastructure (VDI) environments. Some of the icons are borrowed from other collections (see links in my earlier post), and some are unique shapes that I made for this View specific set. This View set has 184 shapes as of today. These shapes provide visuals for all aspects of a View environment, from the actual View server components down to users, group policies, smart cards, SSL certs, apps and the like. Grab the download here: VMware-View-Visio-Stencil. I’m open to suggestions for improving or adding to this collection – leave a comment! I’d love to see diagrams you’ve made – feel free to share them in a comment too! I Downloaded your VMware-View-Visio-Stencil and when I tried to upzip it comes up with error. Cannot open file as archive. Sorry for the problems – can you try the updated Visio Stencils on this page: http://vmtoday.com/2013/05/updated-vmware-horizon-view-visio-shapes-stencil/?